is that just a bunch of paper towels taped up there? that's beautiful! Funny site, I never noticed this whole "l" "L" thing before but I sure will now! id say that people more often write "i" in small letters than "l"
What do they mean by "IN" all refills? Do we put our money in the soda cup before refilling it? 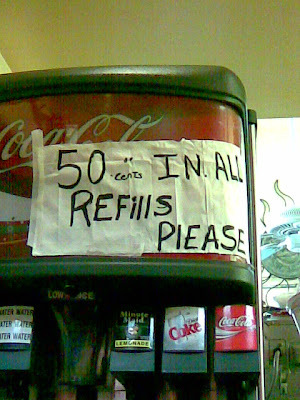 Maybe they get a lot of bums that use the soda cups to pan-handle and the 50 cents is already in the cup? Weird.